Do you have a Twitter account? Swing on over, click the "Follow" button, and say hello! Do you have a Facebook account? Please drop by and ask me a question, make a comment, whichever you like (as long as it's about Bookkeeping, of course). Be sure to click the "Like" button when you are there! Contact me with your question or give me a suggestion. Just enter your bookkeeping & income tax question or suggestions about a specific topic in the box below. I would love to hear from you! Please be sure to be as detailed as possible, and rest assured I have the utmost respect for your privacy. Like most people, I have a strong dislike for SPAM. I will never disclose your details to a third party. Everything you write here is completely confidential. 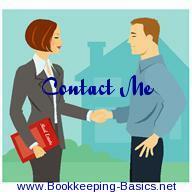 Do you need a bookkeeper? Filling out this questionnaire will allow me to prepare a quote that will address your needs more precisely. Simply download the document, print and fill it in. Then fax or scan, and email it back to me. Are you having difficulties with Bookkeeping? On the Q and A page, you can ask a question about any area of bookkeeping and accounting. It's free and easy to do. If you have a more general question or comment that you believe would benefit others as well, please feel free to go to the Questions and Answers page to post your thoughts directly to my website.